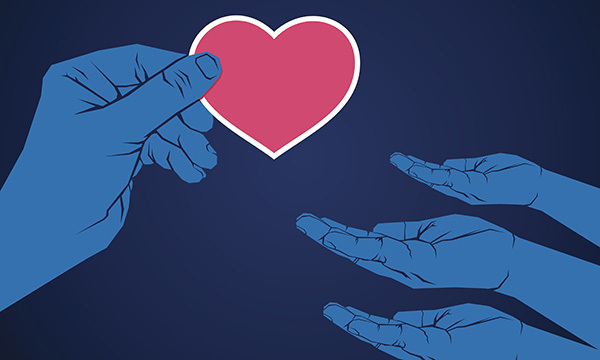 Growing support for a soft opt-out from organ donation, which aims to increase the supply of organs while still giving families the final say, is helping nurses who are at the sharp end when decisions are made. Anthony Clarkson first became aware of the huge power and potential of organ and tissue donation shortly before Christmas 1995. At the time he was working as a staff nurse on an ear, nose and throat ward, with a special interest in head and neck cancers, which meant sometimes caring for people towards the end of life. ‘I had a patient around Christmas who donated his eyes – it was the first time I had come across organ or tissue donation,’ he says. ‘The family had asked if he could be a donor. The patient had discussed it with his family, so they were very clear that he wanted to do it. Today Mr Clarkson is assistant director for organ donation and nursing at NHS Blood and Transplant. It’s a big job that covers all of the UK – the transplant service is unusual in that it is still run on a four-country basis, with different jurisdictions able to change the law around donation. The transplantation landscape is changing. In Wales, a law that came into force in December 2015 means someone is presumed to have given their consent to be a donor unless they have registered their objection (see box). This changed the historical position where people needed to opt in by signing the organ donor register. However, the new system is a soft opt-out, meaning the family of a potential donor has the final say even if the individual opted in by registering. A similar move to legislate for a soft opt-out system has been announced in Scotland, and in October prime minister Theresa May told the Conservative Party conference she wanted to see presumed consent introduced in England, to show that the government was ‘working on behalf of the most vulnerable’. Arguably, the changes to the law are part of a long journey of innovation in organ donation, and there appears to be a growing acceptance that soft opt-out is the way forward. However, it is not welcomed by everyone. Critics say presumed consent does not significantly increase the number of organs available for donation, and some say it risks damaging the relationship of trust between patients and health professionals. 3,710 transplants took place using organs from 1,413 deceased donors. 470 people died while on the waiting list for a transplant, including 14 children. 1,336 people donated kidneys, leading to 2,338 transplants. 198 heart transplants took place, leaving 249 patients still on the waiting list. 178 lung and heart and lung transplants took place, and 378 people remained on the waiting list. 946 liver transplants took place from deceased donors, with 530 people still on the waiting list. The British Transplantation Society has highlighted evidence collated by the Welsh Government’s social research unit showing that, in general, op-out systems have higher donation and lower refusal rates than express consent or opt-in systems. In practice, even in countries which have a hard opt-out system – where families of potential donors are not given the final say – such as Singapore and Austria, doctors are usually reluctant to go against the family’s wishes. Mr Clarkson says a number of initiatives across the UK have increased the number of organs available for transplant and rates have risen by 75% since 2008. Nurses have played a crucial part in this increase, as have campaigns to raise awareness and encourage people to sign up, he says. Prior to 2008, specialist organ donor nurses were based in transplant units, says Mr Clarkson. The nurses then became employees of NHS Blood and Transplant and were based in hospitals across the UK, not only those units that carried out transplants, and their number doubled to around 250. Other steps included ensuring each organisation had an organ donation committee and a clinical lead for donation, with protected time funded by NHS Blood and Transplant. There have also been clinical changes – for example, donations can be taken after cardiac death, instead of waiting for brain stem death as was previously the case. Developments on a UK-wide basis are one thing, but how does it work when different home countries have different laws in place? Specialist donor nurses in Wales received additional training prior to implementation of the new law, but it was also important to raise awareness among all doctors, nurses and other healthcare professionals, as well as among the public. ‘We don’t say that all nurses have to be experts, but they have to know to contact the specialist nurses,’ he says. Wales chief medical officer Frank Atherton says the first year of the new system was positive. ‘Levels of knowledge and understanding among the public about their options are very high – 75% and beyond,’ he says. The Welsh Government launched a campaign in November urging people to talk to their families about donation – the next step in trying to drive up numbers. An advertisement shows a patient’s intention to donate being over-ridden by family members because he did not talk to them about his wishes. ‘We did a lot of media work running up to the change in the law in 2015, and now we’re building on that understanding,’ says Dr Atherton. Mr Clarkson believes the fact that the move is towards a soft opt-out will ensure that most people are on board as changes roll out in Scotland, and probably England. ‘I think Wales going first will have helped – and we know that most people in Wales regard the change positively. But for nurses, I think the soft opt-out is reassuring, because it means you’re still involving the family. As a specialist nurse with the North West Organ Donation Team, which covers north Wales as well as the north west of England, Phil Jones is seeing at firsthand the impact of changes to organ donation laws. Based at Glan Clwyd Hospital in Denbighshire, he joined the organ donation team just as preparations were being made for the change in the law. ‘Our job involves speaking to families, usually in intensive care or A&E, and talking them through their options. If they decide to proceed with donation, then we set it up. It would mean, for example, that a member of the armed forces stationed in Wales would not necessarily be covered by the new law, because they are not there voluntarily. But it would cover their spouse, who has moved there to be with them. It also means students moving to Wales to attend university would not be covered in their first year. He believes the new law makes family conversations easier, partly because the publicity has meant that people in Wales are largely aware of the new law. But he stresses that no matter how much demand there is for organs, the wishes of the family remain paramount. ‘You have to consider the family’s grief,’ he says. In December 2015, legislation came into force to allow people to opt in or opt out of being an organ donor. If they do neither, it is assumed they have opted in, provided they are over 18 and have voluntarily lived in Wales for more than 12 months. Families still have the final say, even if the individual has explicitly opted in. Prime minister Theresa May has indicated she wants to see a move to a soft opt-out system. Has announced no plans as yet to change its opt-in system.